A Hindu wedding ceremony has many components and it can vary according to region and family tradition, but certain aspects all of them have in common: it is always filled with beautiful and meaningful gestures and blessings as well as powerful rituals that are thousands of years old (rooted in the Rig Veda). 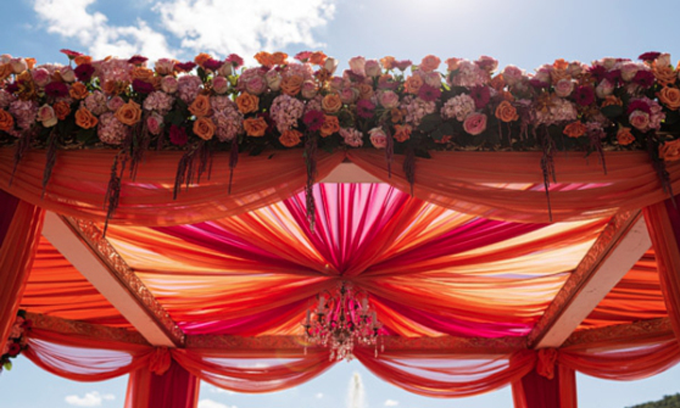 Usually it takes place inside a canopy structure called a mandap. The ceremonies are meant to honor the couple’s love and ensure the success of their marriage by invoking the blessings of various deities and the couple’s families. And one of the most beautiful aspects of a Hindu ceremony is, that bride and groom come to the altar as God and Goddess, in human form. In many parts of India the bride is considered Lakshmi, goddess of wealth and fortune, and the groom is her consort Vishnu, the great preserver and protector of the universe. A Hindu wedding ceremony is a long and elaborate process with every step rooted in Vedic tradition, signifying various aspects of life. An important part of the ceremony is the sacred fire to evoke the fire god Agni as witness to the event. This ceremony asserts that all undertakings are begun in an atmosphere of purity and spirituality. The Hindu priest (usually the family Punditji) is leading the couple through the sacrament of marriage. This ceremony begins by invoking Ganesha, the Hindu god of wisdom and salvation, and the remover of obstacles. Ganesha is depicted with an elephant’s head and is also the symbol of peace, truth, friendship, brotherhood and happiness. By invoking him, he removes any obstacles from the wedding ceremony, which may then be performed without hindrances. As the groom and his party arrive at the ceremony site amidst much singing and dancing (Baraat procession), the bride’s parents, family and friends greet them and the bride’s mother performs a welcoming ritual with akshat (a kind of rice), a tilak dot on the groom’s forehead (kumkum/red vermilion powder, signifying good luck), a lighted lamp and a garland – and leads the groom to the Mandap. 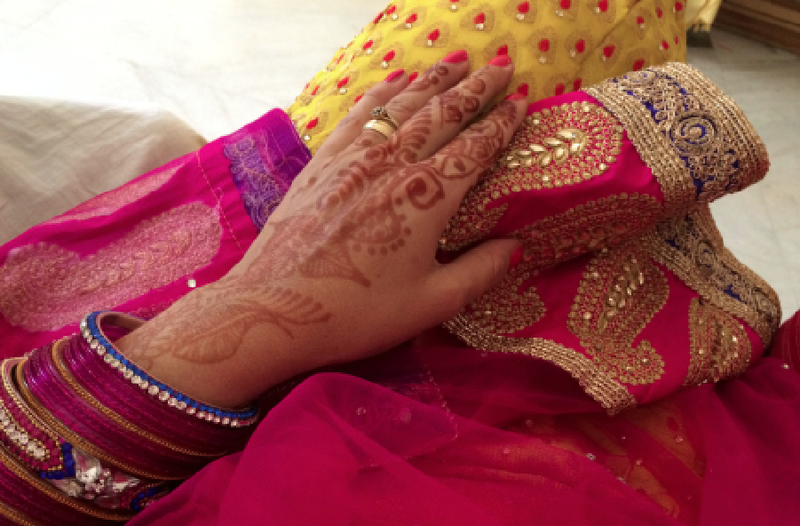 The bride is often escorted to the mandap by a brother or uncle, where the groom waits. Upon arrival, the bride’s father takes her hand and leads her into the mandap. Sometimes a couple is separated by the Antar Patt (veil), which is lowered once the priest invokes a prayer for the couple. Before the wedding begins, the nine planets are invoked by their name in a ceremony called Grahashanti (peace with the planets). Blessings are received from each planet for the couple’s life together. The bride’s parents wash the feet of the bride and groom with milk and water, purifying them for their new life. Then the bride’s family displays the act of giving her to the groom and his family. This ceremony centers on the joining of the bride and groom’s hands. Cotton threads get tied several times around their wrists, while the priest recites mantras and holy verses. Although a single thread can be easily broken, a thread wound many times creates an unbreakable bond, thus the thread acts as a symbol for the couple’s unbreakable bond. The bride and groom proclaim their mutual, love, respect, and acceptance of each other by exchanging garlands (malas) of fresh flowers on each other. The sweet scent of fresh flowers symbolizes happiness of married life. Thereafter they are next seated in front of a holy fire (agni) while the priest recites various mantras from the holy scriptures. In Hinduism, fire is regarded as a purifier and a sustainer of life and during this Mangal Fera ritual the couple offer prayers to the fire by placing ghee, rice and flowers in the flame, praying and exchanging vows of duty, love, fidelity, and respect. The couple circles the fire four times with their wedding scarves tied together. The four circles symbolise Dharma: religion and ethics, Artha: wealth and prosperity, Karma; love, fertility and family, Moksha: spiritual liberation and salvation. The priest directs also family members to make offerings into the fire. During this part the groom may place the Mangalsutra (sacred necklace as a symbol of love and protection) around the bride as an essential part of the ritual, along with that he applies sindoor along the parting of her hair (traditional red colored powder worn by married women along the parting-line of their hair, symbolic for the river of red blood full of life (powder: usually vermilion but traditionally it was made with turmeric and alum or lime). Most couples today are also exchanging wedding rings which has been adopted from western culture. Apart from the mangalasutra, the toe rings (bichhua), kumkum, bangles and nose ring form the items that may indicate that a woman is married. Usually a buffet with appetizers, main courses and a selection of fruit, sweets and drinks – and of course entertainment and DJ. At the end of the ceremony, in a ritual called Saptapadi, the bride and groom take seven vows, sealing the marriage forever. These vows are spoken in Sanskrit and are one of the most ancient aspects of the Hindu marriage ceremony and validate the marriage. Traditionally during Saptapadi, the Seven Steps ritual, the bride’s sari is tied to the groom’s kurta. He leads her in seven steps around the holy fire, while the priest chants the seven blessings or vows. By walking around the fire they are agreeing to these promises. With each step, they throw small amounts of rice into the fire, representing prosperity in their new life together. The first step is taken to provide a living for their household or family, and avoiding those things that might harm a healthy living. The second step is taken to build their physical, mental and spiritual powers. The third step is taken to earn and increase their wealth by righteous and proper means. The fourth step is taken to acquire knowledge, happiness and harmony by mutual love, trust, respect, understanding and faith. The fifth step is taken to be blessed with healthy, righteous and virtous children. The sixth step is taken for self-control and longevity – may the couple live in perfect harmony, true to their personal values and their joint promises. The seventh step is taken to be true to each other, loyal and remain life-long companions who work together for prosperity and happiness. At the conclusion of the ceremony, the priest directs the newlyweds’ eyes to the pole star, which remains steadfast in the sky while the stars around move across the sky. So shall their new marriage be steadfast, though others may change around them. Apparently Hindu rituals get increasingly incorporated into non-denominational or multi-faith ceremonies. This entry was posted in Awakened Hearts (all), Traditions East & West on 04/06/2014 by Marina.